For at least three years, it has been discussed as to whether or not bloggers were making theater critics, and critic in general, obsolete. This is a topic that won’t die, like whether or not print journalism is dead. In fact, the discussion of the irrelevance of print and broadcast theater critics prompted me to discuss this topic in a crudely drawn comic last year. This past week, the Chicago Tribune unveiled a redesigned version with more content. According to Robert Feder’s blog, the subscribers will be charged more, but it currently doesn’t cost more to buy it from the newsstands. With this, the Tribune also unveiled a redesigned website that manages to seem cleaner, despite having numerous submenus, and a mobile app that is easier to navigate and matches the design of the website. The new design features a redesigned nameplate with etchings of Chicago and Chicago landmarks, a new typeface for the stories, a new section on Thursdays for dining, and other additional pages of coverage. My only caveat with the redesign is that there seems to be an inconsistency with the typeface for the headlines, which was something I noticed when looking very closely at the paper. My main question about the new-and-improved Tribune is why they decided to do this. Was this to attract readers they might have lost? Was this done to attract a younger generation of readers? It’s possible that the people that are younger—my generation, the target audience for RedEye—will either be interested in reading a newspaper like the Tribune, stick to RedEye, or not even read a newspaper. 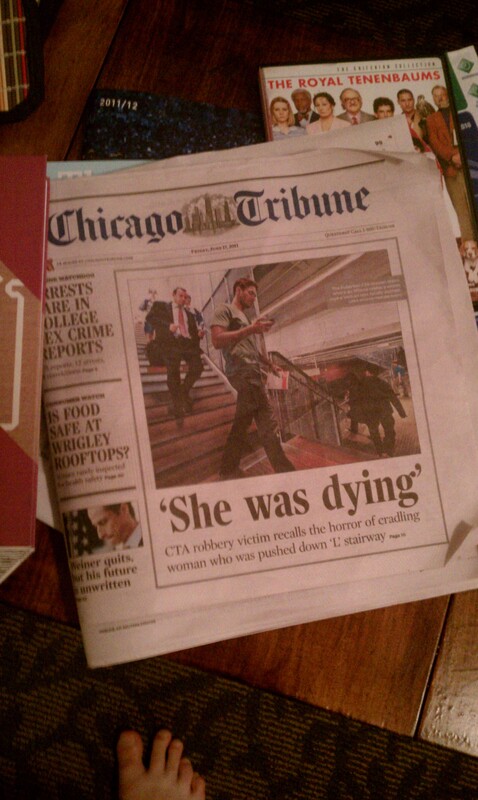 I didn’t pick up a copy of the Tribune on Friday because of the enhancements; I already read the Tribune. I would be curious to see how the circulation numbers change after this, especially in a 20-35-year-old demographic. Ultimately, the changed Tribune looks nice and I like the fact that they’ve added more articles. From a video on the TribNation blog, it seems as though this was done after receiving input from current readers. While it’s important to maintain a strong readership, I would think that newspapers should be trying to attract more readers.